In the lamb slaughterhouse, the animals were again kept in extremely poor conditions, tightly packed in a pen limited by metallic gratings. They were stressed, petrified and piled up on top of each other. While waiting to be killed, the animals screamed in agony as they wounded themselves on the metal gratings. Undercover video can be seen here. A new Animal Equality investigation reveals shocking torture to lambs raised for their meat in Italy. For over a year, undercover investigators have captured shocking footage never seen before by the Italian public. 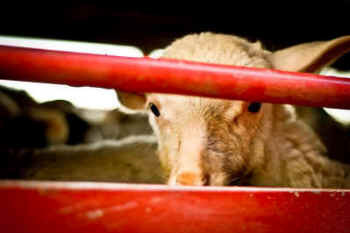 Every year, in Italy during the Easter Holidays, over 4 million lambs, sheep and goats are slaughtered. This is due to the consumption of this meat being a tradition to celebrate the holidays. The extortionate number of lambs killed every year is horrifying and forms part of a cruel massacre. This figure is even greater if we consider sheep and goats, which are exploited equally during this period of the year. The overall number of slaughtered animals prior to Easter totals approximately 800,000. A lamb was left dead for days outside its pen causing a huge risk of contamination for all the other animals. The lamb, which was in an advanced stage of decomposition, hadn’t died the day the images were taken but rather several days before. 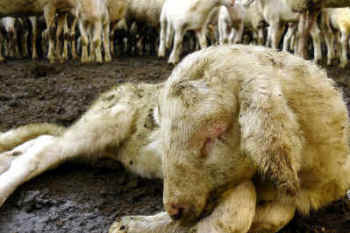 The activists also filmed lambs and sheep that had been left in extremely contracted conditions for hours. This resulted in, severe stressed behaviour and animals trampling on each other. Farm Managers often handled the animals carelessly and with an unnecessary propensity towards violence. The recorded aggressions included the handling of animals by the neck, dragging them to the floor vehemently and throwing them into trucks. The recorded scenes in the slaughterhouses were even more disturbing. In the lamb slaughterhouse, the animals were again kept in extremely poor conditions, tightly packed in a pen limited by metallic gratings. They were stressed, petrified and piled up on top of each other. While waiting to be killed, the animals screamed in agony as they wounded themselves on the metal gratings. When animals are slaughtered, they are not completely stunned and are still aware of what is happening. They continue to kick and flail until they bleed to death. The lambs were observed to be picked up by the forelimbs then shackled and hoisted by the carpi (wrists). This is a painful method of restraint that can lead to injury such as torn muscles and ligaments. This position is very unnatural for these animals and causes them distress as they try to ‘right’ themselves by kicking out which could potentially lead to more serious injuries such as shoulder dislocation or fracture of the carpi. Live, conscious animals were tossed around with absolutely no concessions to the fact that they were alive, aware, and screaming hideously. The animals were sometimes so crowded they could not move. Nothing was done to alleviate hypothermia. The list goes on and on. The slaughter video was equally savage, with fully conscious, struggling animals being bled out and handled with no compassion or mercy. The stunning apparatus on one occasion causes the animal's wool to catch fire. In short, the facility depicted in these videos should be immediately closed down, and the personnel never again be allowed to work around animals. Everyone complicit in these activities should be prosecuted to the fullest extent allowed by the law. I seriously doubt that any ordinary people viewing this footage would ever eat lamb again. Even those who are not Christians can recognize that the Easter holiday is intended as a celebration of life and rebirth. Unfortunately, many choose to celebrate this holiday by consuming the flesh of animals and each year at this time millions of lambs, sheep and goats are killed to provide these grisly feasts. Animal Equality’s undercover video investigation of several farms and slaughterhouses in Italy reveal the brutality that underlies the Easter celebrations and the commercial use of animals. Animal Equality has once again performed a valuable service by raising the question of whether or not we will continue to endorse this taken-for granted brutality. Slaughterhouses must spare animals any avoidable pain and distress related to killing. That is their duty. Unfortunately, lambs at this facility undergo completely avoidable distress and suffering. Handling methods such as hoisting and shackling fully aware lambs are terribly stressful and frightening. Ill lambs are neglected for extended periods of time and conditions are unsanitary. The workers ignore signs of pain and consciousness in dying lambs, rather than taking methods such as re-stunning to lessen their pain. Lambs are gentle animals that deserve humane care and treatment. At present, this operation falls short of meeting even the most basic welfare standards. In light of all the evidence, Animal Equality reports that this is not one single isolated case but it is instead the reality that repeats itself everyday. By means of this investigation, we are launching an informative campaign through SalvaUnAgnello.com (For Italian speakers) to invite people to take a pledge against this violence. The pledge involves the commitment of not consuming products such as lamb meat, as its consumption contributes to the great suffering these animals receive. Therefore, we welcome people to join an animal-free diet this Easter. Moreover, we invite people to request that supermarkets refrain from selling these products. In under 48h, our pledge is proving to be a huge success, with thousands of people joining us to defend lambs during these Easter Holidays! Animal Equality wants to invite the public to reflect on what happens to these very young animals: every year in Italy about 4 million lambs are killed for human consumption and they are partly imported from eastern Europe (mainly Romania) and partly bred in Italy.